As Minister of Employment, Workforce Development and Labour, I am pleased to present the Report on Plans and Priorities for 2016-2017 for the Canadian Centre for Occupational Health and Safety (CCOHS). As Canada's national resource for the advancement of workplace health and safety, CCOHS promotes the total well-being - physical, psychosocial and mental health - of the working population in Canada. They do this by providing information, education, and tools that support workplace health and safety and the prevention of occupational injury and illness. CCOHS was created to provide unbiased, reliable, and practical occupational health and safety information to help employers create healthy, productive workplaces, and to provide employees in Canada the information they need to educate and protect themselves. This 2016-17 Report on Plans and Priorities of the Canadian Centre for Occupational Health and Safety provides information on how the department will support the Government on achieving our agenda in the coming year and I am fully confident that the Canadian Centre for Occupational Health and Safety is prepared to successfully support me and work with our partners inside and outside government to deliver for Canadians. However, given our commitment to more effective reporting, this year’s report will be the final submission using the existing reporting framework. The Prime Minister and the President of the Treasury Board are working to develop new, simplified and more effective reporting processes that will better allow Parliament and Canadians to monitor our Government’s progress on delivering real change to Canadians. In the future, the CCOHS’ reports to Parliament will focus more transparently on how we are using our resources to fulfill our commitments and achieve results for Canadians. These new reporting mechanisms will allow Canadians to more easily follow our Department’s progress towards delivering on our priorities, which were outlined in the Prime Minister’s mandate letter to me. The Canadian Centre for Occupational Health and Safety (CCOHS) was founded by an Act of Parliament in 1978 with a mandate to promote health and safety in the workplace and to enhance the physical and mental health of working Canadians. CCOHS operates under the legislative authority of the Canadian Centre for Occupational Health and Safety Act (S.C., 1977-78, c. 29) which was passed by unanimous vote in the Canadian Parliament. The purpose of this Act is to promote the fundamental right of Canadians to a healthy and safe working environment by creating a national institute (CCOHS) concerned with the study, encouragement and co-operative advancement of occupational health and safety. CCOHS functions as an independent departmental corporation under Schedule II of the Financial Administration Act and is accountable to Parliament through the Minister of Employment, Workforce Development and Labour. Its funding is derived from a combination of appropriations, cost recoveries and collaboration with the provinces. It is expected that a portion of the budget will be funded through cost recoveries from the creation, production, and worldwide sales of fee-for-service and revenue generating occupational health and safety products and services. CCOHS has a broad range of collaborative arrangements with many national and international health and safety organizations. These include the International Labour Organization (ILO), the Centre for Applied Research in Mental Health and Addiction (CARMHA), the World Health Organization (WHO), North American Occupational Safety and Health Week (NAOSH), European Agency for Safety and Health at Work and Health Canada. Further information on the many partnerships is available at www.ccohs.ca/ccohs/partner.html and in our annual report. Strategic Outcome: Improved workplace conditions and practices that enhance the health, safety and well-being of working Canadians. Program: Occupational health and safety information development, delivery services and tripartite collaboration. Description: Improving the national profile of CCOHS and increasing awareness of the available products and services increases general workplace health and safety. Description: CCOHS sells a portion of its products and services in order to recover some of the costs associated with developing and delivering occupational health and safety content to Canadians. An improved cost recovery program will enable the organization to reinvest those resources to develop new products and services, including free public services, ultimately leading to safer workplaces in Canada. Description: Broadening the reach of CCOHS to include more Canadian workplaces helps ensure that more Canadians benefit from best practices in workplace health and safety. 1Type is defined as follows: previously committed to—committed to in the first or second fiscal year prior to the subject year of the report; ongoing—committed to at least three fiscal years prior to the subject year of the report; and new—newly committed to in the reporting year of the Report on Plans and Priorities or the Departmental Performance Report. CCOHS relies heavily on cost recovery programs and contributions from partners to supplement its parliamentary appropriations and cover fixed costs. The CCOHS funding model is based upon a target of 50% of our operating budget being generated through cost recovery. Therefore, our products and services must be continually updated to be marketable. CCOHS also works very closely with various Government and non-profit partners. Changes to our partners’ funding can have a direct impact on our revenues and our ability to deliver our products and services to Canadians. CCOHS is proactively managing this risk by improving its cost recovery program. Continuous improvement in technology continues to change the landscape for CCOHS. The Centre delivers the majority of its products and services to Canadians through electronic delivery and must stay up to date on new technology as traditional delivery methods for its content are unsustainable and out-dated. CCOHS has responded by expanding its on-line resources to include more specialized web portals, e-learning programs, webinars, podcasts, Facebook and Twitter promotion and on-line discussion groups. We continue to develop mobile apps to help workers assess hazards and risks. These new channels are key to supporting our priority to expand our reach and impact of Canadians on a daily basis. CCOHS is investing in the technology required to support these new communication channels and is challenged to do so with a limited operating budget. Strategic Outcome 1: Improved workplace conditions and practices that enhance the health, safety and well-being of working Canadians. The Canadian Centre for Occupational Health and Safety’s planned cash expenditures remain the same as previous years however the increase in Main Estimates and Planned Spending shown in the tables above reflect a change in the funding model. CCOHS will no longer use a vote netting authority to collect and spend revenues and will instead use the existing authority provided in Section 6 (1)(g) of the Canadian Centre for Occupational Health and Safety Act. In the past, the revenues collected by the Centre were netted from the expenditures and only the net amount of expenditures was reflected above. Under the new model, revenues earned under the statutory authority ($4.3 Million) cannot be netted from the expenditures. This significant change in the funding model will allow CCOHS to invest in growth in order to better meet the needs and demands of working Canadians. All other fluctuations in funding shown above are primarily due to carry forward amounts and recovery of paylist shortfall amounts for severance pay, parental leave benefits, etc. Spending is impacted by the ability to raise revenues to cover the unfunded portion of the budget. 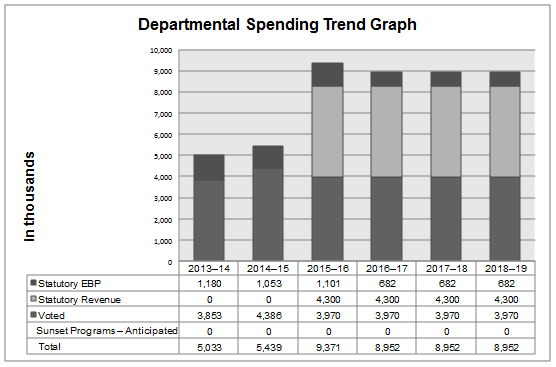 For the years 2013-14 and 2014-15, the total spending includes all Parliamentary appropriations and revenue sources including Main Estimates, Supplementary Estimates, respendable revenues and operating budget carry forwards. For the 2015-16 through 2018-19 periods, CCOHS is using a statutory revenue spending authority per Section 6 (1)(g) of the Canadian Centre for Occupational Health and Safety Act. In prior years, revenues were netted from expenditures, which is no longer applicable under the statutory authority. On a true comparative basis, total planned net spending in 2016-17 is $4,652K, which translates to a reduction of 14% over 2014-15 levels. For information on the Canadian Centre for Occupational Health and Safety’s organizational appropriations, consult the 2016–17 Main Estimates. 1.Strategic Outcome: Improved workplace conditions and practices that enhance the health, safety, and well-being of working Canadians. 1.1 Program: Occupational health and safety information development, delivery services and tripartite collaboration. The goal of this public service program is to provide free information on occupational health and safety to support Canadians in their efforts to work safely and create healthy and safe workplaces. Citizens are provided information through a free and impartial personalized service via telephone, e-mail, person-to-person, fax or mail. Alternatively, they can independently access a broad range of electronic and print resources developed to support safety and health information needs of Canadians. This may include cost recovery products and services and is supported financially by contributions from various stakeholders. Through health and safety information development, CCOHS collects, processes, evaluates, creates and publishes authoritative information resources on occupational health and safety for the benefit of all working Canadians. This information is used for education and training, research, development of policy and best practices, improvement of health and safety programs, achieving compliance, and for personal use. When the product or service provided by CCOHS is offered to identifiable external recipients with benefits beyond those enjoyed by the general public, the product or service becomes part of the cost-recovery program and a fee is charged. CCOHS promotes and facilitates consultation and cooperation among federal, provincial and territorial jurisdictions and participation by labour, management and other stakeholders in the establishment and maintenance of high standards and occupational health and safety initiatives for the Canadian context. The sharing of resources results in the coordinated and mutually beneficial development of unique programs, products and services. Collaborative projects are usually supported with a combination of financial and non-financial contributions to the programs by partners and stakeholders and result in advancement of the health and safety initiatives. We continue to sharpen our focus on the cost recovery program in order to support the strategic outcome of the organization. A successful cost recovery program is key to ensuring the sustainability of CCOHS operations. We will continue to refresh our Information Technology (IT) infrastructure to ensure we continue to meet ongoing needs of CCOHS stakeholders. The future-oriented Condensed Statement of Operations provides a general overview of the Canadian Centre for Occupational Health and Safety’s (CCOHS) operations. The forecast of financial information on expenses and revenues is prepared on an accrual accounting basis to strengthen accountability and to improve transparency and financial management. Because the Future-Oriented Condensed Statement of Operations is prepared on an accrual accounting basis, and the forecast and planned spending amounts presented in other sections of the Report on Plans and Priorities are prepared on an expenditure basis, amounts may differ. A more detailed Future-Oriented Statement of Operations and associated notes, including a reconciliation of the net cost of operations to the requested authorities, are available on CCOHS’ website. CCOHS continues to focus on growth while emphasizing cost containment for 2016-17. We expect a slight increase in revenues leading to a slightly reduced net cost of operations. The tax system can be used to achieve public policy objectives through the application of special measures such as low tax rates, exemptions, deductions, deferrals and credits. The Department of Finance Canada publishes cost estimates and projections for these measures year in the Tax Expenditures and Evaluations publication. The tax measures presented in that publication are the responsibility of the Minister of Finance. budgetary expenditures: Operating and capital expenditures; transfer payments to other levels of government, organizations or individuals; and payments to Crown corporations. full time equivalent: A measure of the extent to which an employee represents a full person year charge against a departmental budget. Full time equivalents are calculated as a ratio of assigned hours of work to scheduled hours of work. Scheduled hours of work are set out in collective agreements. Government of Canada outcomes: A set of 16 high level objectives defined for the government as a whole, grouped in four spending areas: economic affairs, social affairs, international affairs and government affairs. non budgetary expenditures: Net outlays and receipts related to loans, investments and advances, which change the composition of the financial assets of the Government of Canada. performance: What an organization did with its resources to achieve its results, how well those results compare to what the organization intended to achieve, and how well lessons learned have been identified. performance reporting: The process of communicating evidence based performance information. Performance reporting supports decision making, accountability and transparency. Report on Plans and Priorities: Provides information on the plans and expected performance of appropriated organizations over a three year period. These reports are tabled in Parliament each spring. statutory expenditures: Expenditures that Parliament has approved through legislation other than appropriation acts. The legislation sets out the purpose of the expenditures and the terms and conditions under which they may be made. Strategic Outcome: A long term and enduring benefit to Canadians that is linked to the organization’s mandate, vision and core functions. sunset program: A time limited program that does not have an ongoing funding and policy authority. When the program is set to expire, a decision must be made whether to continue the program. In the case of a renewal, the decision specifies the scope, funding level and duration. voted expenditures: Expenditures that Parliament approves annually through an Appropriation Act. The Vote wording becomes the governing conditions under which these expenditures may be made. whole of government framework: Maps the financial contributions of federal organizations receiving appropriations by aligning their Programs to a set of 16 government wide, high level outcome areas, grouped under four spending areas.